Mechanistic studies of homo- and heterogeneous, as well as biological catalysis, often seek to understand changes in chemical speciation during turnover. Hard X-rays like those available at CHESS can provide an element-specific probe of geometric and electronic structure at or around an absorbing atom. Also, their lower attenuation at ambient pressure, compared to soft X-rays, makes them ideally suited to the study of molecules and materials in situ. Recently, vanadium Kβ X-ray emission spectroscopy (XES) performed using the dual-array valence emission spectrometer (DAVES) at C-line helped to create a fundamental understanding of perturbations in the valence electronic structure of vanadium ions in a range of oxidation states and chemical environments. Vanadium oxides are a key component of heterogeneous catalysts for oxidative alkane dehydrogenation, and vanadium-dependent metalloenzymes also perform a range of biochemical transformations. Thus, the development of vanadium K-shell X-ray spectroscopy as an element-selective tool for understanding changes in structure may help to advance mechanistic knowledge of key catalytic processes in both chemistry and biology. The use of DAVES at C-line allowed better V Kβ XES spectra to be obtained in less time compared to previous measurements. The more idealized Rowland geometry and the new position-sensitive Pilatus Si pixel array detector ensured optimal spectrometer alignment throughout the 60 eV spectral range. Furthermore, a more rigorous background intensity correction could be performed, using a tightly windowed digital region of interest (ROI). The overall improvement in signal-to-noise achieved using this new spectrometer provided high quality spectra in the weak valence-to-core (VtC) region, where insight into metal-ligand interactions was obtained. 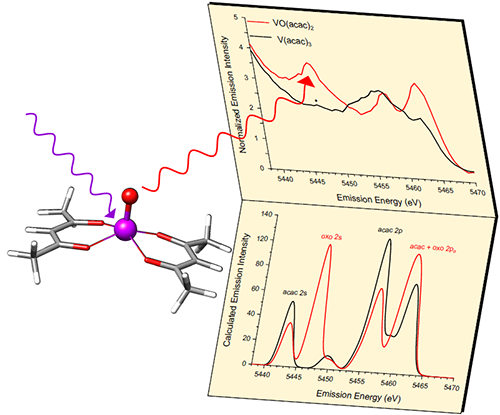 The Kβ XES spectra of a set of vanadium oxides and molecular complexes were correlated to the corresponding X-ray absorption spectra, as well as density functional theory calculations. The insight obtained regarding both changes in vanadium-ligand interactions and diagnostic spectral features should be applicable to the in situ study of vanadium-containing catalytic systems.